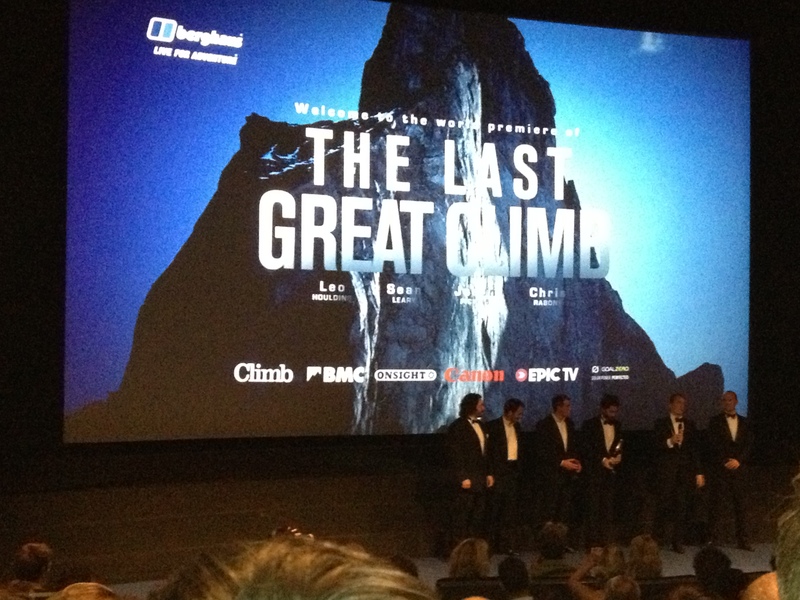 Monday 4th November saw the London Premier of Alastair Lee’s film, ‘The Last Great Climb’. A wonderfully inspiring documentary about adventure climber Leo Holding’s expedition to climb the North East ridge of Ulvetanna: The Wolf’s Tooth, in Antarctica. The atmosphere right from entering the cinema held a real buzz of positivity, passion and friendliness. How often do you feel that upon entering a room full of strangers? Winding my way through the incredibly good looking and fit crowd (well it was full of climbing enthusiasts!) I sought out my old school friend Jason (or ‘Pickles’ as we all used to call him – original nickname hey..?!). He was nervous and confessed to not particularly liking being in the spotlight. This is understandable from a well grounded, northern town lad. Jason was and always is very humble about the opportunities that come his way. After a few more words of encouragement, which no doubt didn’t help to ease his nervousness(! ), Jason went off to have some press photos & the rest of us were ushered into the screening room. 3) To have a safe expedition and ensure everyone comes back home safely. All three were thankfully and amazingly achieved. In celebration of this fact a well deserved bottle of champers was opened in a rather unique fashion by Leo and enjoyed by the team. Simply put, it was absolutely brilliant. It captures the essence of the stunning landscape, the team, their talent, their humour and their personalities beautifully. The film footage & photography had been edited fluently with the teams personal thoughts and reactions interspersed with the finesse and technicalities of the climbing. The knowledge of adventure filming and skill required from Al and Dave (as well as the teams cooperation) to produce this footage was definitely not underestimated. The final effect was that of space, peace, beauty, skill, friendship and ultimately an appreciation of life. There was humour mixed throughout, even when conditions seemed to be fighting against their climbing. It was this humour and the tight bond of friendship, trust and humility that makes this wonderful viewing. I wanted to cry at times; definitely not through sadness but from feeling heart-warmed and exhilarated. It really honestly touched me. This, alongside the fact that the whole team are so lovely, decent and inspiring really moved me. An open Q & A session with the team hosted by the legendary climber Doug Scott CBE, rounded off the evening, giving us more insightful stories about the trip and the teams thoughts and feelings. After managing to have a final quick work with Jason, I left the theatre with a feeling positive and inspired!